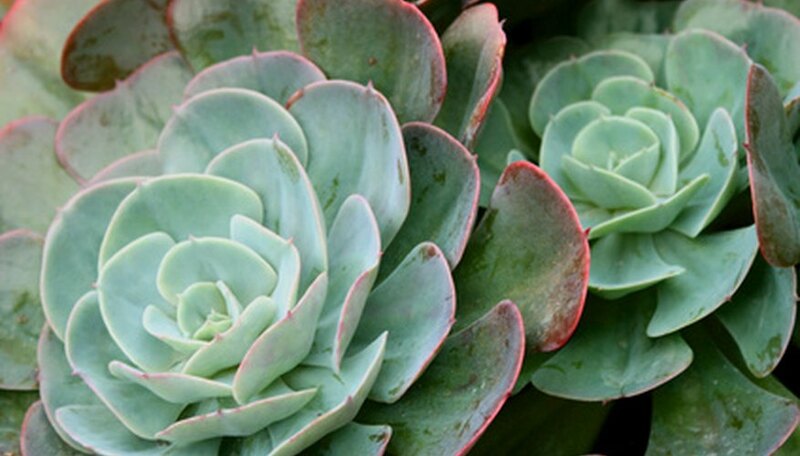 The leaves and stems of succulents are thick and fleshy to store necessary water. Many of these plants do extremely well when grown indoors. According to the University of Minnesota, many succulents, such as cacti, thrive in low humidity situations. Low humidity is defined between 10 percent and 30 percent relative humidity. Cacti typically require less water than the smooth leaved succulents. Watering succulents requires observation of the plant and soil as there are no steadfast rules or specific water amounts. Plant succulents in an equal mixture of potting soil and coarse sand. The plants must be in a container that is well drained to duplicate the plants' natural environment. Use a pot that has bottom drainage holes. During the watering process, all excess moisture must drain from the succulent roots. Water the succulent during the low light winter months when signs of the plant’s leaves begin to show signs of withering and shrinking. Add water to the porous soil thoroughly until the excess begins to drain from the lower drainage holes. If the pot sits in a shallow pan, remove all excess water from the pan to prevent the roots from rotting. Allow the soil to completely dry out between watering. Test the soil with the tip of your finger during the warm spring and summer months. Observations of the plant’s leaves are the best indicator for adding water. The best basic rule of thumb is to only add water when the soil is completely dry, and the succulent leaves begin to shrink slightly. Move the warm weather plants outdoors into a semi-shaded location during late spring and early summer. Gradually move the plants to a sunnier location and monitor the watering needs. Immediate placement of the succulents to bright sun, from an indoor location, may cause the succulent leaves to brown out. Over watering the cacti and succulents will weaken them. Keep cacti and succulents separated when growing in containers, as cacti will require lees frequent watering than a succulent.